A theologically-driven, biblical primer geared toward teaching young people about God and His story shared with us through His word. 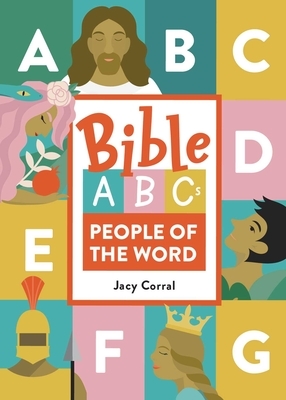 From Adam to Zaccheus, Bible ABCs: People of the Word, written and illustrated by Jacy Corral, introduces young readers to both prominent and less familiar characters in the Biblical narrative. Throughout the pages of this stunning board book, each letter form is illustrated with components of the featured person’s story and significance in the Bible. A bible verse accompanies the artwork for each letter. People of the Word a new—and fun!—way for parents, grandparents, and caregivers to introduce young children to both big and small stories from the Bible. Jacy Corral is an illustrator, hand lettering artist, graphic designer, wife, and mom. After enjoying an extensive career in corporate marketing and design, she traded fancy slacks for yoga pants to focus on the great privilege of raising her daughter, investing in her home and marriage, and creating artwork that helps people to connect and reflect. In 2017, Jacy illustrated ECPA bestseller (#35) Big and Little Coloring Devotional. Jacy lives with her husband, two children, and miniature poodle in West Los Angeles, California.